I know, it's a bad pun but Method Homes in Seattle, WA really is going to SEED (Sustainable Education Every Day) by building a net-zero modular classroom that will serve as a low-impact environment for organizations around the world. Method Homes as partnered with "The SEED Collaborative", a non-profit organization focused on sustainable education. At 960 sq ft, the SEED classroom is portable enough to be moved where it is needed but tough enough to last 100 years in service, far outlasting the expected 10 year life span of its commercially produced contemporaries. It's designed to be free of all environmental toxins, constructed of environmentally friendly materials, restorative and educational. Each SEED consists of three modules. 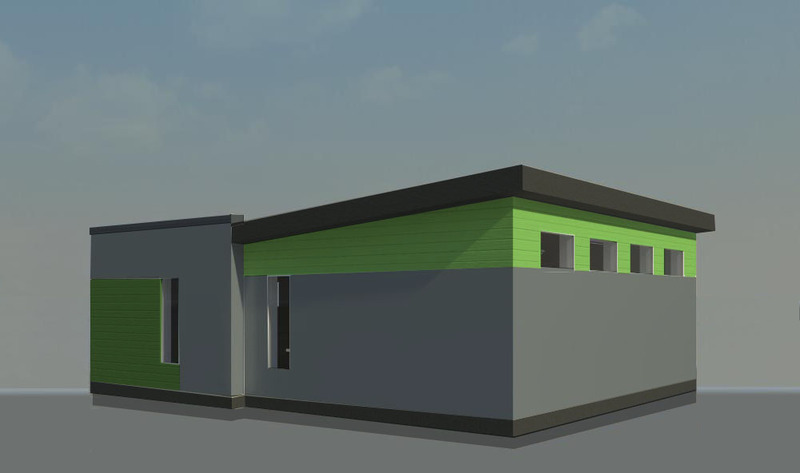 The core module houses everything it needs to be self-sustaining while the two side modules create the classroom and entry. It can be shipped anywhere in the world. Built to the specifications of the Living Building Challenge, SEED is net-zero energy and water. Solar panels provide all of its electricity and the water used for the laboratory, toilet-room sinks, and agriculture is collected from the roof. The lab sink is operated by hand pump so that students can see how much water is required to wash their hands. Grey water from sinks will be filtered and treated by a food-producing living wall. The SEED’s core module also features a composting toilet. The first SEED pod will be donated to a pubic school in Jasper in Alberta, Canada. Coach..I know how much you like to hammer on west coast pre-fab companies and can't wait for your comments about the costs of this product! 3 mods for 960 sf? So freight and set and finish costs are going to be??? Standing by for your critique. Since this is a project that is being given to a school as a research classroom, I have no way of knowing the sq ft costs. What I do find fascinating is the total 'off the gird' way this classroom can be operated. Am I a fan of west coast prefabs. No!, but I do make an exception for Method Homes because they seem to be successfully marketing to a broader market at a better price than my buddies at Black and Blu Homes. As an update, I was not invited to NYC to see Blu's display or enjoy the inevitable After Show Wine and Cheese party.